There are two Snowbird Seasons. The first season arrives the day after Thanksgiving and runs to about the third week of January. That’s approximately two months in winter when auto transport customers flock by the tens of thousands from the cold, snowy northern states (hence the term “Snowbird”) to the warmer southern states, especially Florida. The second Snowbird Season commences when those same car transport customers start returning home by the tens of thousands around the first week of April, and finish doing so by the end of May. If you think about it, and being in the auto transport business means we must do that, roughly 4 months of every year is Snow Bird Season. 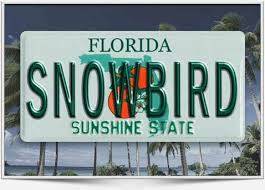 Having answered the question when are the snowbird seasons in Florida, and elsewhere, we hasten to add that most car shipping companies really associate the term with the Sunshine State. Certainly there is a fair share of snowbirds car shipping to California, Texas and Arizona for the winter. But compared to those warm weather states, Florida is on steroids when it comes to snowbird transport. Interstates I-95 and I-75 have snowbird auto transport carriers teaming up and down to Florida every winter and spring. There are five main Florida area destinations that attract from the north. In other words, southeastern Florida on the coast of the Atlantic Ocean. It’s about a 1,500 mile straight shot down I-95 from New England states Massachusetts, New Hampshire, Vermont and Maine to this sunny Florida enclave of communities. From Vero Beach to Miami, one beach town connects to the next beach town for about 150 miles almost uninterrupted. It is also a favorite destination for New Yorkers and other Atlantic Seaboard cities in Connecticut, New Jersey, Philadelphia, Baltimore, Wilmington and elsewhere. When it comes to snowbird seasons from the cold, wintery north, there is no place that attracts more people. In February, the southeastern Florida daytime high temperatures average around 77 degrees and the water is about 73 degrees. Swing west over to the Gulf of Mexico side to find the second most popular Florida destination. The temperatures on the southwestern Gulf side are similar to the Atlantic Miami side with high 70’s in February. But the water tends to be several degrees cooler, around 66 degrees. That water temperature is okay for a small percentage of people, but most folks prefer 70-75 degree water temperature for a swim. Almost everybody will swim in 80 degree water. The Gulf of Mexico side of Florida tends to attract more midwestern Snowbirds from Michigan, Ohio, Indiana, Illinois, Wisconsin, Minnesota, Missouri and Iowa. It’s a tad easier to reach by traveling down I-75. The central and northeastern coast regions of Florida are the third highest draws for Snowbirds. The average February temperatures are in the high 60’s to low 70’s, but the water temperatures are considerably cooler at around 56 degrees. The water temperature more than anything probably explains why it is not as popular as south Florida. Never-the-less, the beaches are beautiful and 70 degree days sure do beat the harsh winter weather up north. Think of Jimmy Buffett looking for his lost shaker of salt when you think of the Florida Keys. Made you smile, didn’t we? Tropical breezes with the same warm air and water temperatures as south Florida makes the Florida Keys a favorite place to spend the winter. Did you know Key West is far closer to Havana, Cuba (90 miles) than it is to Miami (150 miles)? But we throw caution to those balmy winds. As nice as the Florida Keys are, they are a nightmare to ship cars. Look at the map, folks. No auto transporter just happens to be in the neighborhood or passing through to someplace else. There’s only one road in and one road out for nearly one hundred miles. And if the Snowbird customer is in Key West, that becomes a 200 mile round trip. Ugh! There are three solutions. First, wait and be patient. Actually very patient. Second, keep adding more money to lure a carrier into fetching your vehicle, and still not know for sure when one will come. Or third, agree to meet a carrier in Key Largo or Homestead, which makes the pool of possible carriers much greater because of the proximity to greater Miami. Folks sometimes forget about the Florida Panhandle. And guess what? They want you to forget about them. Why? Because the Florida Panhandle beaches are gorgeous! The sand is clean and white, soft and beautiful. And they want it all for themselves! The average February temperatures both air (66 degrees) and water (58 degrees) are similar to north Florida. That makes it maybe a little less appealing for some who like it hot. However, if you are not much of a swimmer, then this place might be right for you. The Panhandle is easy for Snowbird midwesterners and southerners to get there for the winter. The only caveat is that even in the busiest of seasons, Panhandle shipments tend to move slower. Regardless of all weather, auto transport shipments during Snowbird Season may require patience no matter what area you are trying to ship a car. If you are moving to Florida for the winter, dear Snowbird, there is no such thing as a great deal. Sorry to inform. Because the Snowbirds are competing with one another for precious carrier space. Highest paying goes first. There is no reservation system to speak of. No space is being held for you. The same is especially true upon returning home from Florida in the spring. Tens of thousands of Snowbird car transporters just like you wanting the same thing, a fast ticket to ride home. How do you win? The smartest and least stressful thing to do, is go with Direct Express Auto Transport‘s Expedited (+$75) or Rush (+$175) rates, which increase dramatically your vehicle’s chances of shipping faster. Expect a degree of frustration with the Florida Snowbird Seasons regular or Standard rates. There is simply too much competition. Do yourself a little favor and add more. That’s our best advice.